Lois Pollock writes: I met Kennie at Lakeview High School, Entebbe. I was doing a combined training in Memory Books; entrepreneurship; savings & small business for year 6 students. I was aware of Kennie throughout the three-day training as he was very engaged, asking lots of intelligent, searching questions. In small groups I saw he was a strong group leader, mentoring some of the less able participants. At the end of the training, he asked to talk with me in private - and told me his personal story. Kennie was born on 11th May 1990. His mother deserted the family when he was very young and he has no real memory of her. His father remarried and had two more children - but unfortunately died when Kennie was 12 years old. For a year or two, Kennie continued to live in his father's house in the village. But then his step-mother and her two sons left. As a young adult, Kennie has tried to locate his mother and some of his other relatives. Sadly this has not proved possible. Because the family was broken up when he was so young he finds himself with no relatives to whom he can turn. He knows his step-brother lives in Kampala, but they are not in contact. He has a frail grandmother living in his home village, Gunda. Kennie enjoyed school and one way or another was determined to continue his education. He heard about Lakeview High School, run by the Church of Uganda but with a diverse group of students - religiously very tolerant and with good academic results. Kennie made his way to Entebbe and told the headmaster his story. He asked if the school could accommodate him, and provide him with secondary education in return for his performing various tasks around the school. Kennie told me - “I have survived by doing physical work like slashing the school compound, cleaning the class rooms and other school buildings: this has covered my school fees. I expect to finish school this year as I am now in Senior 6. After A-level, I want to continue my studies." He said he could raise funds by doing small jobs or starting a business to supplement any donor help. Kennie said his long term ambition is to become a business man or a “good financial controller and business researcher”. He gave his other interests as football, friends, helping older people, music, reading novels and watching plays. 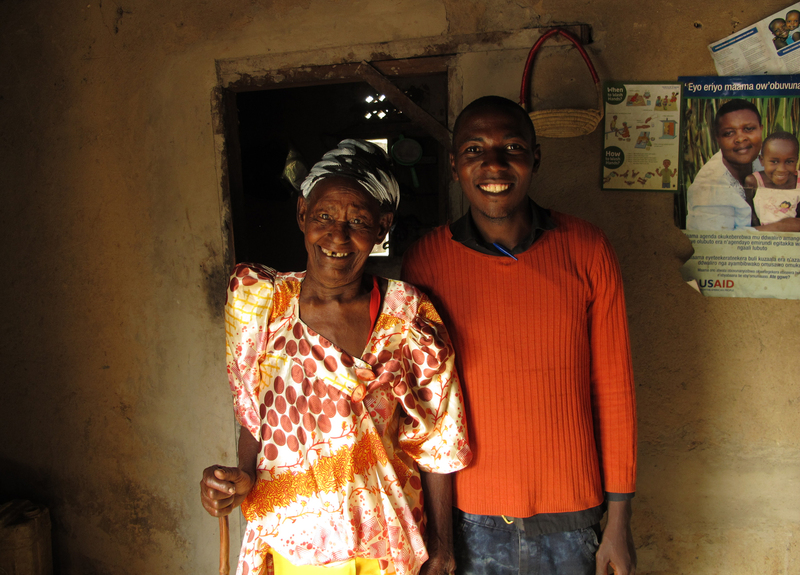 Recently, Kennie found his grandmother unwell with malaria, and not sleeping under a mosquito net, back home in Gunda. He asked if I would go and do some teaching in his village. We performed a two-day training in February 2014 and you can see a separate write-up here - Gunda village. A certified copy of his 'O' level results for 2011 shows he took 8 subjects: English, Christian Religious Ed; History, Geography, Luganda, Mathematics, Physics, Chemistry, Biology and Commerce. He achieved highly in Mathematics and Science and passed all others satisfactorily. The Deputy Headteacher at Lakeview, Mwanje Francis Kintu - whom I met in 2013, and who has known Kennie for six years - has confirmed Kennie's academic ability and capacity for tertiary study. He described Kennie as self disciplined, a hard-driven learner and a student deserving of the opportunity for further education. After I heard his story and checked the facts, a number of family and friends in the UK and Australia committed to paying for his continued education. He is applying to Makerere University Business School that will eventually lead to a degree in Entrepreneurship and Small Business Management. Due to his lack of family support and parlous financial situation, Kennie is going to take a longer route to his degree so that along the way he can seek paid employment or start his own small business. As his situation improves, he will upgrade from certificate to diploma and finally to degree. The Trust will meet all his tuition fees and some additional costs in the first year and consider each year thereafter. Lakeview High School has agreed that he can stay on the campus, receiving board and lodging in return for ongoing practical work around the school, until his course begins. He is currently helping construct a new classroom, and is quite proud of the fact that over the years he has helped build many of the school buildings. Following our 2013 training session, he has also embraced sack-gardening - successfully nurturing a variety of green vegetables and tomatoes enjoyed by all the pupils. 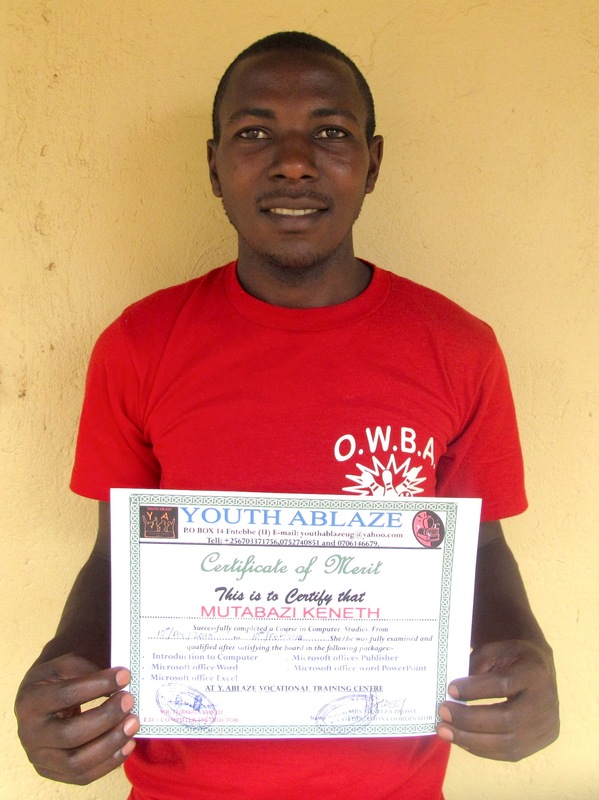 Kennie is an excellent example of the kind of young person that EHT Uganda seeks funding to support. He is a hardworking, public-spirited, intelligent and enterprising young man, but through poverty and circumstance has been unable to proceed beyond secondary school. The greatest hope for a sustainable, democratic future for Uganda - honoring human rights and promoting justice and equality for all - lies in supporting young people like Kennie.